This palace has an area of 218,400 sq. metres and is surrounded by walls built in 1783. The length of the four walls totals 1900 metres. 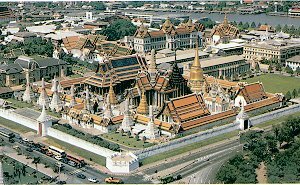 Within these walls are situated government offices and the Chapel Royal of the Emerald Buddha besides the royal residences. When Siam restored law and order after the Fall of Ayutthaya the monarch lived in Dhonburi on the other side of the river. Rama I, immediately on ascending the throne, moved the centre of administration to this side of the Caopraya; and, after erecting public monuments such as fortifications and monasteries, built a palace to serve not only as his residence but also his offices - the various ministries, only one of which remains in the palace walls. 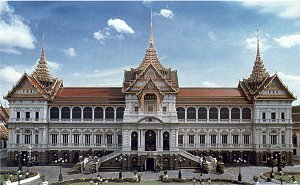 This palace came to be known as the Grand Palace, in which the earliest edifices contemporary with the foundation of Bangkok were the two groups of residences named the Dusit - Mahaprasad and the Mahamontien. The Cakri group was built and resided in by King Culalonkorn, Rama V ( 1868 - 1910). Only the reception portion is now used, consisting of two wings for reception purposes decorated with galleries of portraiture. In between is the central throne - hall now used for various purposes and invariably for the reception of foreign envoys on the occasions of the presentation of their credentials. It is aptly decorated with four canvasses of diplomatic receptions. One on the right as one enters depicts the reception by Queen Victoria of King Monkut's ambassador in London, further on Louis XIV's reception of the mission sent by King Narai of Ayudhya in the Gallerie des Gleces in the palace of Versailles; a third, on the other side of the room, King Monkut's reception of the French Envoy, and the fourth the reception at Fontainebleau by the Emperor Napoleon III of another Siamese Mission. The crystal decorations of the hall are mostly presents from foreign monarchs to King Culalonkorn. By the side of the inner grand staircase is the dining hall attached to the building.